The book that inspired Marie Kondo's The Life Changing Magic of Tidying Up, Nagisa Tatsumi's international bestseller offers a practical plan to figure out what to keep and what to discard so you can get--and stay--tidy, once and for all. Practical and inspiring, The Art of Discarding (the book that originally inspired a young Marie Kondo to start cleaning up her closets) offers hands-on advice and easy-to-follow guidelines to help readers learn how to finally let go of stuff that is holding them back--as well as sage advice on acquiring less in the first place. Author Nagisa Tatsumi urges us to reflect on our attitude to possessing things and to have the courage and conviction to get rid of all the stuff we really don't need, offering advice on how to tackle the things that pile up at home and take back control. 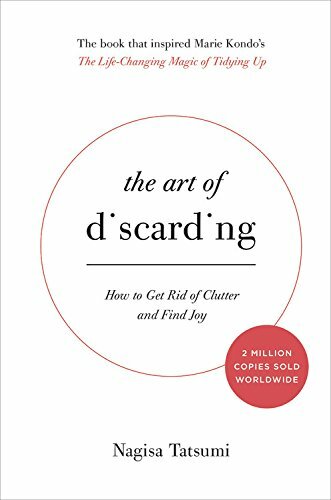 By learning the art of discarding you will gain space, free yourself from "accumulation syndrome," and find new joy and purpose in your clutter-free life. Sasaki explores the philosophy and cultural history of minimalism from Buddhism to Steve Jobs.